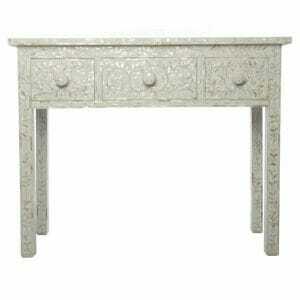 All furniture at Iris is distinctive in its own right, and this includes our selection of handcrafted dressing tables. They are a luxurious example of flawless design, fusing traditional methods of Indian craftsmanship with a contemporary flourish. Each and every dressing table we make is created in our workshops from the very best in ethically-sourced and quality materials. 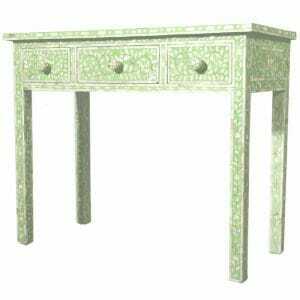 Our selection of dressing tables is finished with exquisite inlays. Our decadent mother of pearl inlay designs simply oozes opulence, while the simple but elegant three-drawer design can keep cosmetics, jewellery and accessories out of sight, additionally providing a surface for displaying any items that might require immediate use. The mother of pearl is skillfully embossed into the solid Sheesham and Mango wood and is then carved into mosaic-like and naturalist themed, Indian Rangoli designs. Iris furniture and furnishings products are made from 100% natural materials, and their high quality is only reflected further in their appearance and functionality. The mother of pearl inlay used in our dressing table selection shimmers brightly, making an Iris’ dressing table a superb focal point in any bedroom. The secret of great design is said to combine form and function, and Iris prides itself on achieving both. Our dressing tables, like our desks, are most suited to adding a unique and luxurious touch of glamour to your bedroom or dressing room. Craftsmanship methods used for hundreds of years in palaces of India are still kept well and truly alive by our incredible team, with materials regulated at source as 100% cruelty-free. Please browse our extensive website further for our full range and contact us for a unique and personal service. Iris Furnishings is pleased to present one of Britain’s largest and most impressive ranges of genuine Indian imported furniture. As part of this extensive selection, we offer high quality dressing tables, mirrors, wardrobes, cupboards, tables, and more. On these pages you’ll find our elegant dressing tables, which can be purchased in an array of dazzling colours, styles and sizes, each expertly hand crafted and of the highest quality. Rest assured that when you find the perfect piece, it will infuse your home with the magic of India for generations to come. Our extensive range of decorative art dressing tables includes our best-selling mother of pearl inlay range, which can be ordered in an array of striking colours, from a soft, romantic pink to a strong, bold dark blue. If you want to create a an elegant atmosphere in your bedroom, consider our popular white mother of pearl dressing table, which combines the ornamented arrangement of delicate mother of pearl with the subtle contrast of the white wood for a timeless style. 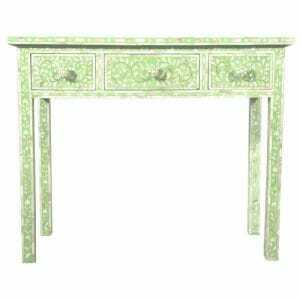 Or bring a hint of magic into your home interior décor with our luscious green mother of pearl dressing table. And remember you can have your artisan dressing table made in any of the colours or patterns you see in our furniture collection. Or in fact in any of the decorative ornament finishes we offer, to the specifications of your choice. Read on to find out more about custom made furniture. 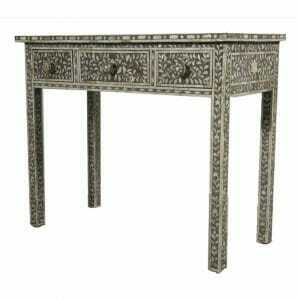 The combination of colour and ornament in well-crafted wood furniture can infuse your home with beauty and elegance. Creating A Custom Made Bedroom Suite with Our Bespoke Service? Our exquisite mother of pearl inlay dressing tables make eye-catching focal points for any room, and can stand elegantly alone or paired with a matching mother of pearl inlay mirror for a polished look. Our stock moves quickly, so if you can’t find exactly what you’re looking for online or in our showroom, don’t hesitate to let us know. We’re always happy to work with our customers’ specifications to create bespoke pieces, guaranteeing that you receive the exact dressing table that you desire, and one that fits your home perfectly. We offer custom made furniture at no extra cost for the service and a bespoke dressing table is priced just the same way as our pre-made Indian furniture. Whether ordering a matching bedroom suite or a single item, payment is in instalments and we keep you updated every step of the way, delivering your luxury, hand made, bespoke artisan furniture on a day to suit as soon as it arrives with us. Iris Furniture manufacturing process relies on an individual, creative approach to every single piece of furniture. 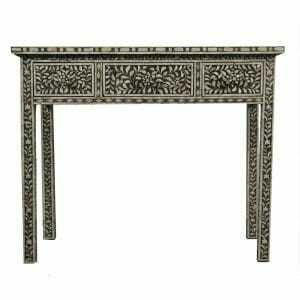 This means any of the furniture pieces you see on our website can be made to measure in any of the decorative finishes we offer, that’s embossed or smooth white metal, mother of pearl or ethically harvested camel bone inlay, decorated or plain distressed painted wood or even the beautiful, white carved finish you can find elsewhere on our website. Give yourself all the time you need to choose your favourite decorative finish and as soon as you have settled on your outer measurements, get in touch with us and we’ll let you know your quote straight away and how long you can expect to wait for your luxury, hand made artisan dressing table to arrive with you from India. 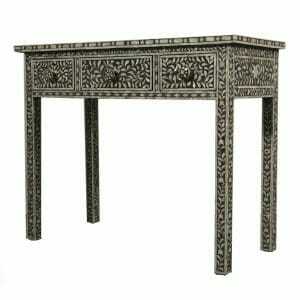 Are Our Indian Dressing Tables Ethical? At Iris Furnishing we take ethical and environmental standards seriously. We ensure that we follow strict fair trade standards to ensure that all of our tradesmen and suppliers are well rewarded for their hard work. All of the materials used in our products are cruelty-free and renewably sourced to ensure the lowest environmental impact on our planet. We personally ensure these standards are upheld through frequent visits to our workshops in person. In short, you can always be proud to have our furniture in your home. At Iris Furnishings, we feel that decorative art and stunning aesthetics go hand in hand with high quality workmanship in a combination of styled furniture products, built to last and made to be well used. And all of this is achieved ethically and ecologically through fair trade agreements that honour the master craftsmen and their methods, which have long upheld these values. 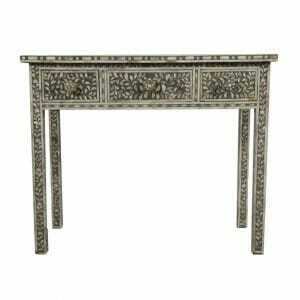 Where Do Our Artisan Indian Dressing Tables Come From? 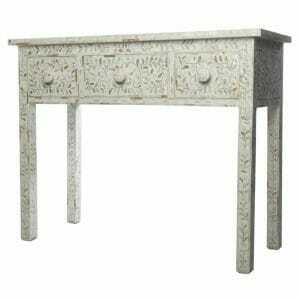 All of our dressing tables exemplify the height of Indian craftsmanship and sophistication. Each piece has been expertly hand carved and made from countless fragments of genuine mother of pearl which are hand shaped and polished to a high shine before being carefully inlaid onto the wood. All of our furniture is crafted at our workshops in Rajasthan using the same ancient techniques used to create the fine, antique furniture found in India’s magnificent palaces. Bring home one of our items and you’ll bring home a true piece of Indian tradition.